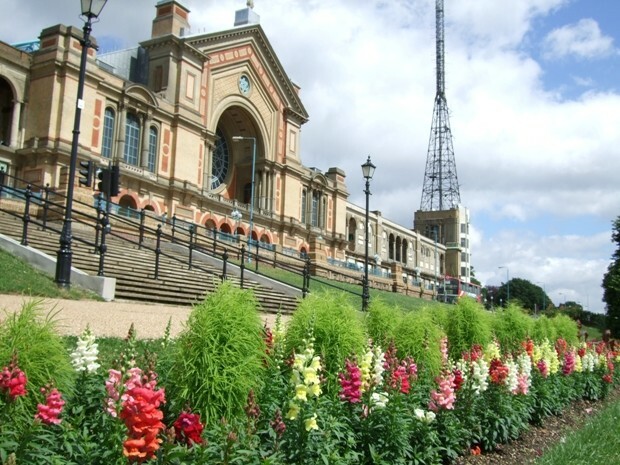 Alexandra Palace is in North London, standing in and dominating Alexandra Park, an area of greenery between Hornsey, Muswell Hill and Wood Green. The building itself was built in 1873 as a public centre of recreation, education and entertainment and as North London’s counterpart to the Crystal Palace in South London. The 7 acre Glass Palace is surrounded by 196 acres of beautiful parkland, and grounds that boast a pub and restaurant, ice rink, boating lake, pitch & putt course. Designed to be “The People’s Palace” it was later nicknamed “Ally Pally” (allegedly by Gracie Fields). In 1936 it became the headquarters of the world’s first regular public television service, operated by the BBC. The Alexandra Palace television station was located on the site and its radio tower is still in use. Lynne Featherstone MP worked with VocalEyes Describer Kirstin Smith on the description of Alexandra Palace for London Beyond Sight (2012). Exit Wood Green tube station and turn left and cross over the main road by Barclays Bank via the controlled crossing onto the High Street; immediately cross over the High Street at the controlled crossing outside the Hollywood Centre and bear right into Station Road. Continue along Station Road past the Alexandra Palace mainline station on your right. At the junction bear left onto Buckingham Road and over the railway bridge over the mainline station and turn left into Bedford Road; there is a brown directional sign to Alexandra Palace on the bridge. Continue along Bedford Road which turns into South Terrace on entry into the grounds of Alexandra Palace. Continue on South Terrace to a small roundabout, go through that roundabout and Alexandra Palace main Palm Court entrance is on the right. There are two sets of 12 steps, with a small landing separating the two. There are blue iron handrails either side; the pathways within the park are uneven and there is building work currently being undertaken. Parking – Public parking is available on site; 1,500 spaces.